Summary: A primary goal is to compare stable isotope results with telemetry results to determine the efficacy of using stable isotopes to elucidate post-nesting migratory destinations of sea turtles. Stable isotope analysis of skin and eggshell tissue (which reflect foraging areas) will be compared with the oceanographic regions visited during satellite tracking. Stable isotope values that are consistently different for females in oceanic vs. neritic habitats lend credence to their use to infer post-nesting migratory destinations. A lack of matching between isotope values (pre-nesting habitat) and satellite tracks (post-nesting habitats) would suggest a) that loggerheads do not exhibit philopatry to foraging regions, or b) that loggerhead habitat use is too flexible to use isotopes in inferring habitat use. A consistent isotope-telemetry match among individuals would suggest that stable isotopes can be used in lieu of the more expensive satellite telemetry approach to potentially infer foraging grounds. Results: Satellite tags were deployed initially on 22 loggerheads, 1 green turtle. In these deployments, there were 2 early tag failures (20-23 d) for unknown reasons with no recovery, 1 removal recovery (13d) to avoid potential detachment with the same ptt reapplied later on another turtle, 1 mortality (29d) with carcass recovery, removal of ptt and same reapplied to another turtle. During migration, a loggerhead (Wham) was attacked by a shark on Cuba’s north coast, loosing a flipper and although moving steadily toward the Yucatan, was carried by currents back to the Dry Tortugas where she stranded and was eventually transferred to the Marathon Turtle Hospital for rehabilitation, and a second release. The green turtle (Kessie) was tracked to Campeche, Mexico and the tag locations indicate that she was probably harvested in mid November. Details from the Mexican authorities were sparse, but the tag was eventually recovered and returned to Mote in mid March. 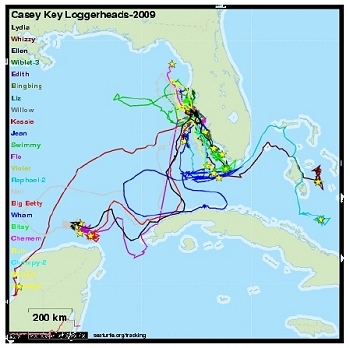 In the end, 17 of 18 loggerheads and 1 green turtle were tracked to home foraging grounds. There were 7 tags still transmitting as of 4/8/10. Three remigrant turtles were tracked for a second history to evaluate fidelity to the foraging ground and all 3 females returned to the same foraging grounds. Other significant findings related to clutch frequency and site fidelity were included in a recent journal article. Map: Loggerhead turtles were tracked to neritic or pelagic habitats of the southwest Florida Shelf, Tampa Bay, Charlotte Harbor, the Everglades, Florida Keys, the Bahamas, and Mexico. The green turtle delayed migration for a month, remaining near the nesting beach at Casey Key before departure to the NW Yucatan Peninsula as of 2009-10-14. It was harvested about mid November 2009 and the tag recovered by Mexican conservation authorities and returned in mid March 2010.